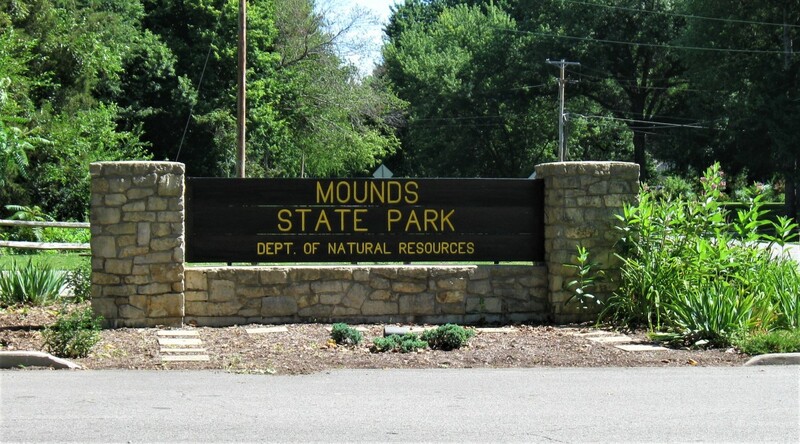 Mounds State Park is located east of Anderson, Indiana off of highway 232. 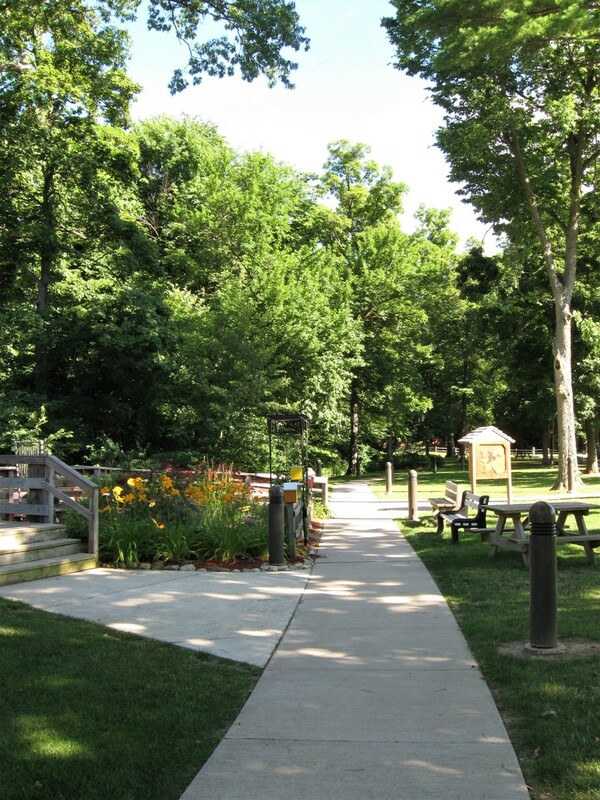 It's a small state park established in 1930 that encompasses 290 acres of land and includes 6 miles of hiking trails. 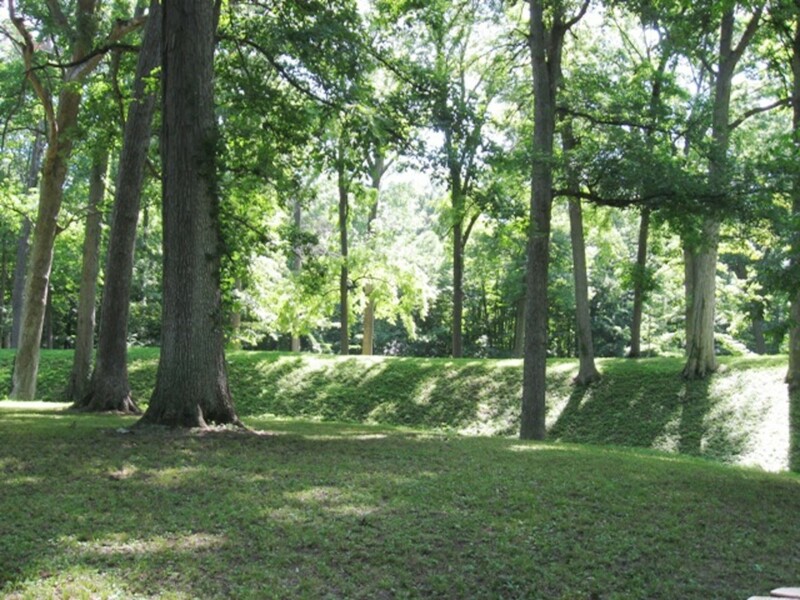 Of greater historical importance, however, is the presence of 10 Indiana mounds and earthworks within the park. 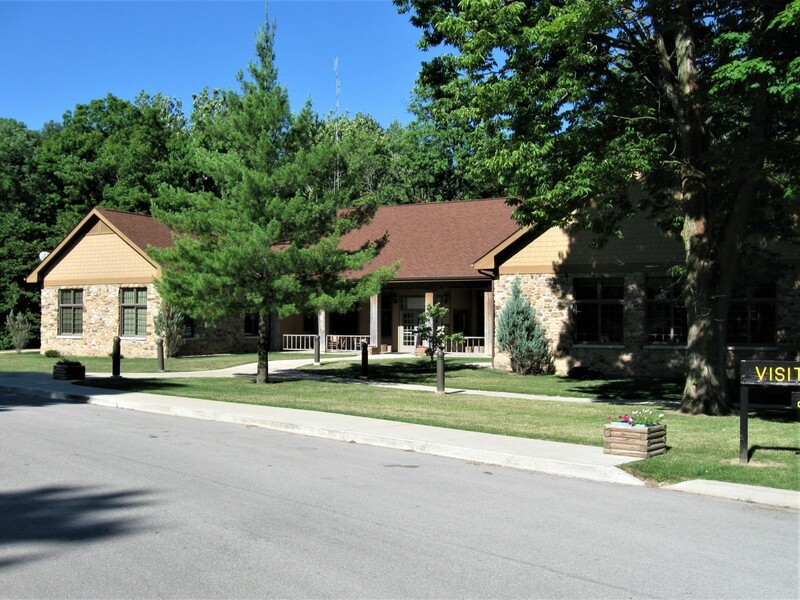 In this article, you will learn more about the park its trails as well as a bit of history about the original inhabitants of the area: the Adena and Hopewell Indians. Mounds State Park lies along the White River. 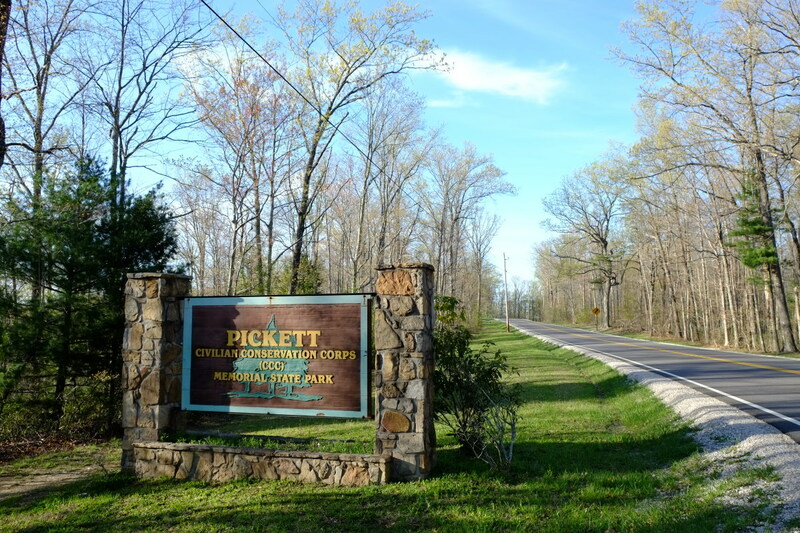 It offers users several picnic areas, a pool, a campground, a Visitors Center, and several miles of hiking trails. 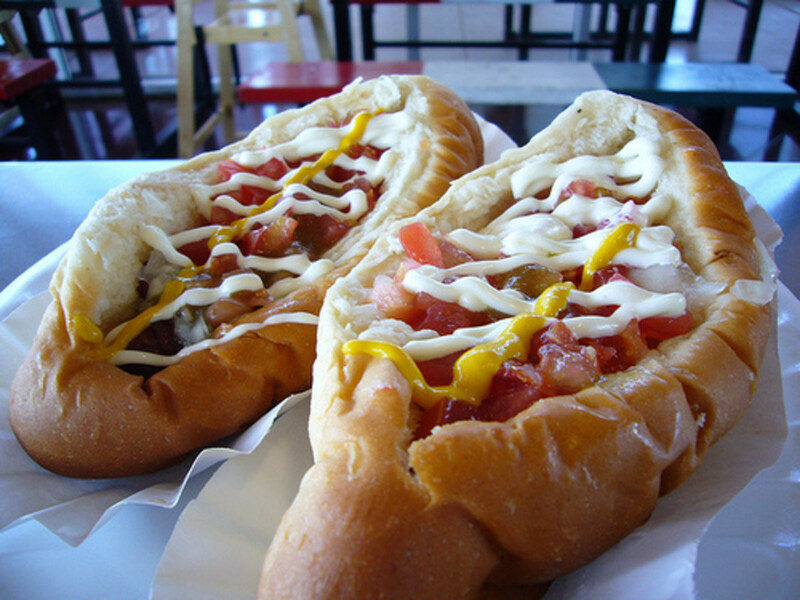 Visit here for a park map. The park is home to a variety of wildflowers that put on an impressive display March through May each year. Snow Trillium, Harbinger-of-Spring, Hepatica, Bloodroot, Toothwort, Mayapple, Rue Anemone, Spring Cress, Shooting Star Violets, Wild Ginger, Wild Columbine, Prairie Trillium, Spring Beauty, Skunk Cabbage, Trout Lily, Solomon's Seal, Marsh Marigold, Dutchman's Breeches, Golden Ragwort, Shooting Star, Waterleaf, Virginia Bluebells, Phlox, Spiderwort, and Jack-in-the-Pulpit are among the common sights. During the 1800's the land that makes up the park was owned by a family of German origin, the Bronnenbergs. 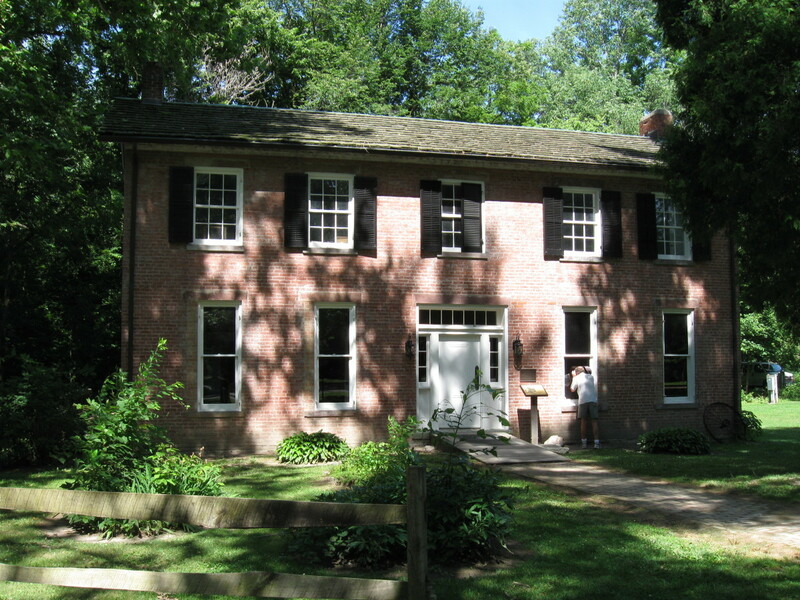 In fact, the two-story brick home of Frederick Bronnenberg Jr is still maintained on the grounds and is open for tours. The park was donated to the state in 1930. There are 10 mounds and earthworks within the park boundaries. 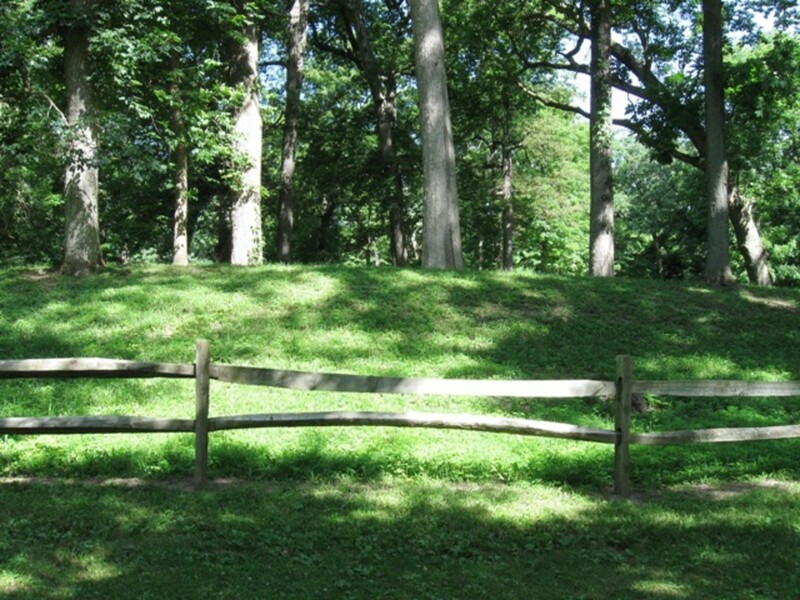 These Indian mounds are believed to have been built by the Adena and Hopewell Indians around 150 B.C. There have been various theories behind why mound builders would have constructed these earthen structures over the years, however, it is generally believed that they were used primarily for astronomical observations. It is believed that the land was cleared, and the mounds gave them a clear horizon from which to view the stars, moon, and visible planets. This could have potentially allowed them to track their calendar for a variety of purposes including the growing/harvesting seasons. Some of the earthworks were probably also used for religious ceremonies, with the outer rings keeping the activities in the center of the mound private. Although some remains were discovered buried there, it does not appear that burial was the primary purpose of the mounds. Above, you will see a view of the Great mound from the outside (It's outer ring). On the central platform looking out toward the outer ring. The mound is a circular structure with a large mound, which is flat on top, in the middle; this forms the "central platform". This is then surrounded by a large ditch and an outer ring of mounded earth around it. There is a narrow strip of earth built up that protrudes from the outside, across the ditch, into the center of the mound allowing easy access to the central platform. The photo above shows a view from inside, at the top of the Great Mound (the central platform) looking across to the outer ring. Other nearby sites such the Fiddle Back Mound and other earthworks played a part in tracking the winter and summer solstice or spring and autumn equinoxes. These can all be viewed easily from the trail system. The Adena Indians were the original mound builders in the area, but more than a hundred years later, there is evidence that the Hopewell Indians left their mark on the mounds as well. Most of the hiking at Mounds State Park is easy to moderate. Trail 5 is the longest trail (2.5 miles) and basically runs around the perimeter of the park. 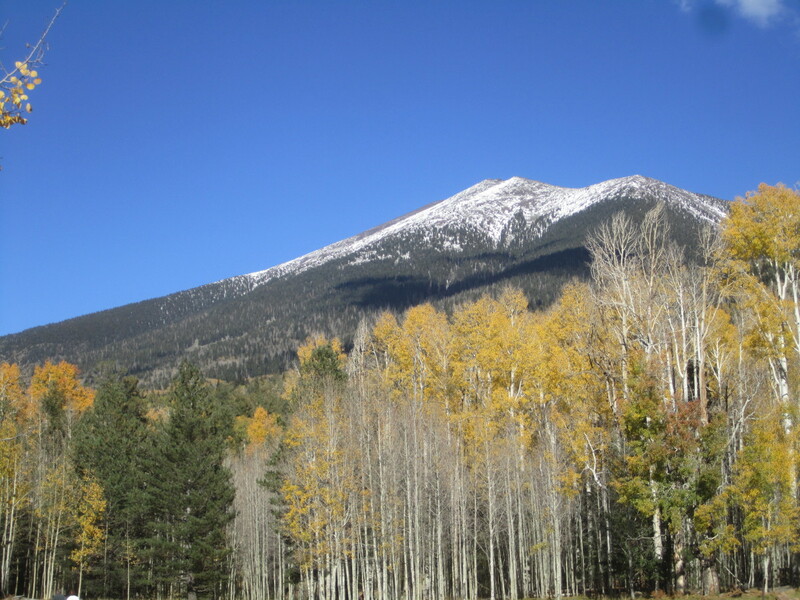 It offers hiking with some moderate climbs. The path is wide and the footing is good. In fact, it's not uncommon for runners to use the path for training. Trail 5 also gives hikers access to all of the other trails in the park and thus, all of the mounds and earthworks. Trail 1 is easy (1 mile long) and takes visitors directly to the Great Mound, Fiddle Back Mound, and a couple of earthworks. The hardest part of this hike is merely reading the map to determine how to return to your original destination as the trail loops around on itself. Trail 2 is only a half mile long and although it is rated as rugged, it is merely a connecting trail that runs from trails 1 and 5 to the Visitor Center area. 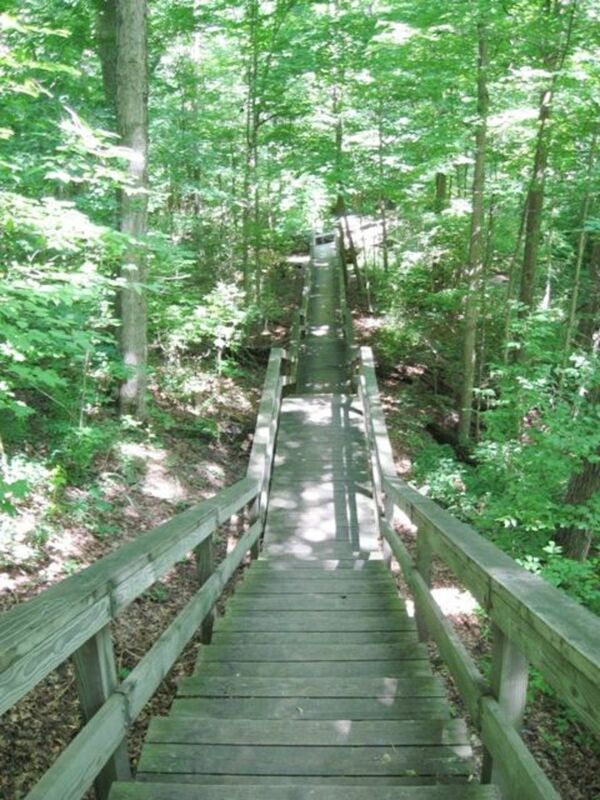 It's rugged due to the fact it consists primarily of a boardwalk and many steps down to the other trails. The picture above was taken along trail 5 as it runs parallel to the White River. There are several overlooks which provide a nice spot to relax and take in a view of the water below. 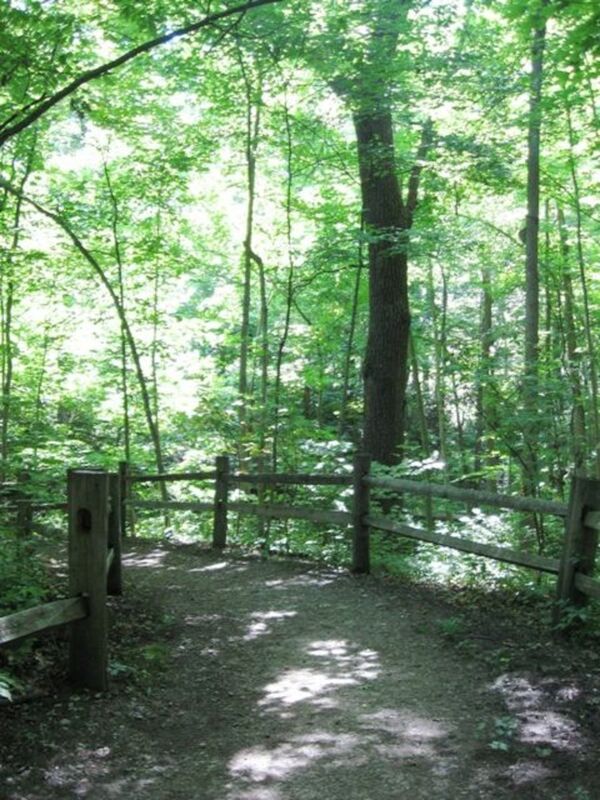 Trail 3 is just under a mile long and meanders through the wooded center of the park. It gives visitors a great chance to enjoy the trees and the birds in the area. 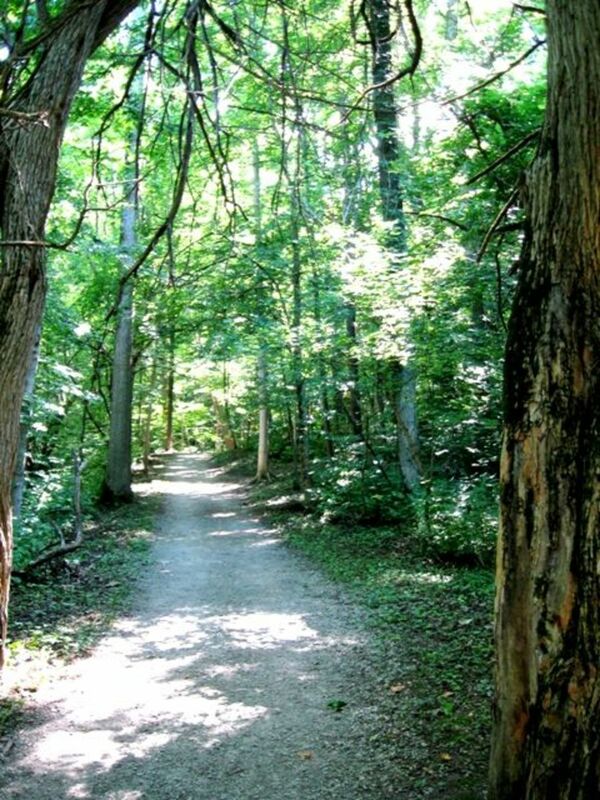 it can be picked up behind the nature center or at various points along Trail 5. 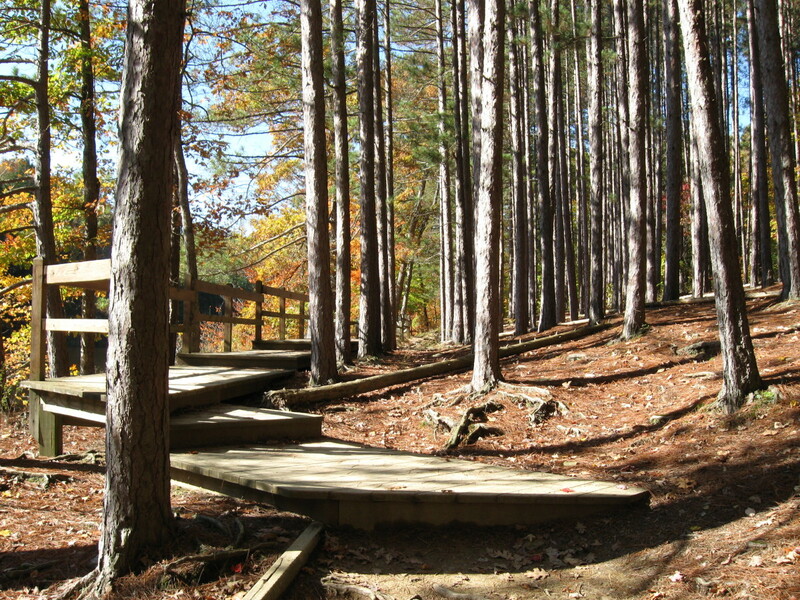 Trail 4 is the most rugged hike at Mounds State Park. It's a mere .7 miles long but includes some steep climbs/descents. 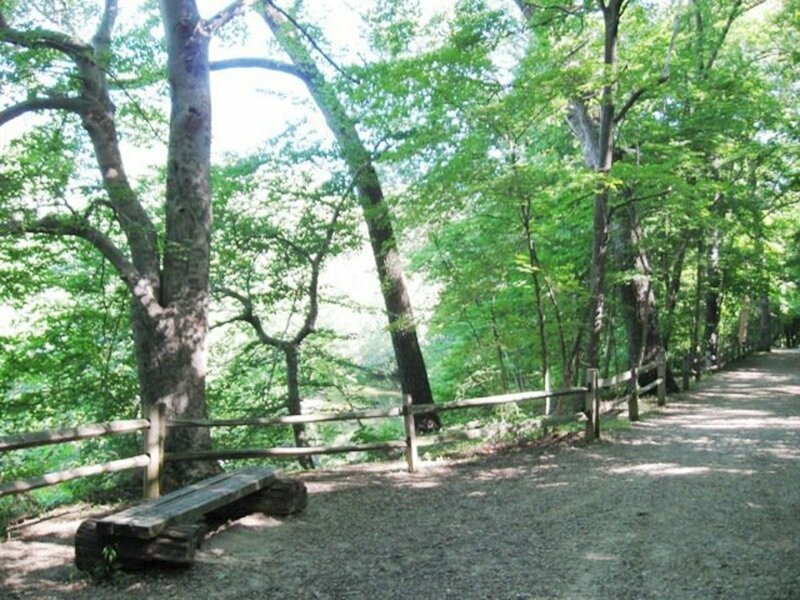 The picture above shows the hike on Trail 4 heading into a ravine going from the campground. Trail 4 can be picked up there, at the pool, or from various points along Trail 5. Trail 6 is the final hiking opportunity and runs between the campgrounds and canoe launch site. It's only .4 miles long and an easy walk. Overall, the trails at the park are well maintained. Marking is not present at all intersections, however, and keeping your map on hand is important to avoid frustration and a great deal of backtracking. Mounds State Park is really a nice park. The mounds are pretty cool. And it's not overly crowded like some state parks. And the trails are cool too. When I visited there the volunteer working in the house told me that the family who originally owned the land made sure that nobody bothered the mounds even though people wanted to go dig around in the area. many experts claim that mound builders were not the people we call Indians (they say some were unusually tall) and that LaSalle saw some of them when he first arrived in the region. 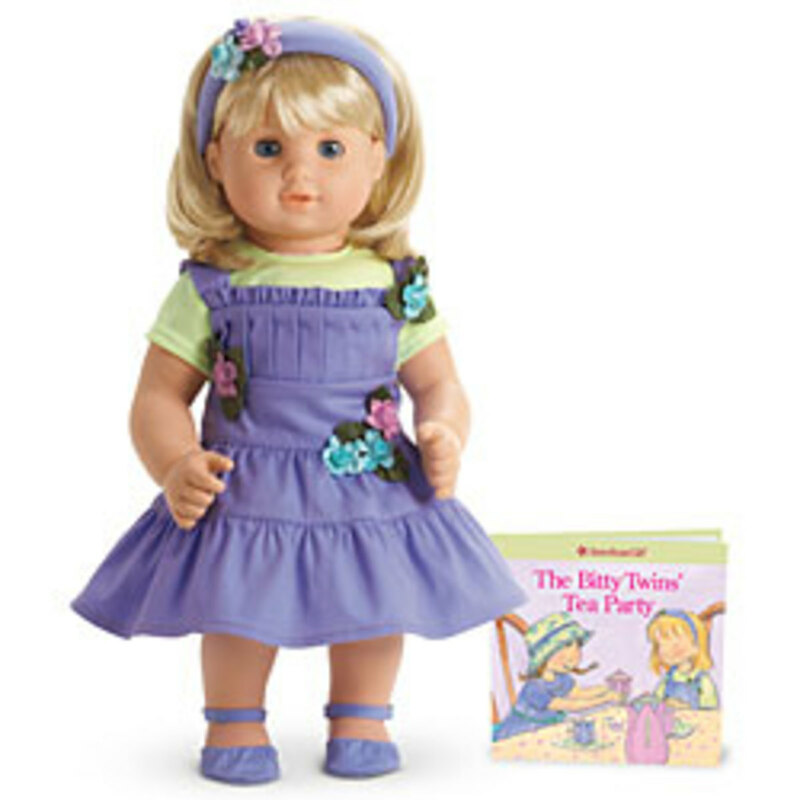 curious if any DNA evidence has been found. Another fine lens...I had to visit your mounds, as we have famous mounds in my area too, they were burial mounds built by the laurel culture as much as 10000 years ago. On the US side of Rainy River, the mounds are located near the confluence of the Big Fork River. On the Canadian side, mounds are located near the town of Sratton. Fascinating lens, beautifully presented. I'm intrigued by the Mound Builders. Grew up near Mounds, did a report on it in gradeschool, and thought it was the coolest thing! The Mound Builders and their Mounds are fascinating! Thanks for this lens that shows them in this beautiful park setting. Now if I'm ever in Indiana it'd be a place I'd like to visit!